TAP by Todd Pownell is a result of the talents and experiences of Todd Pownell, Debra Rosen, and their small team working out of Cleveland, Ohio. Todd Pownell is a technically trained goldsmith and graduate gemologist, while Debra Rosen has experience rooted in European studio atelier practice and jewelry fine art traditions. 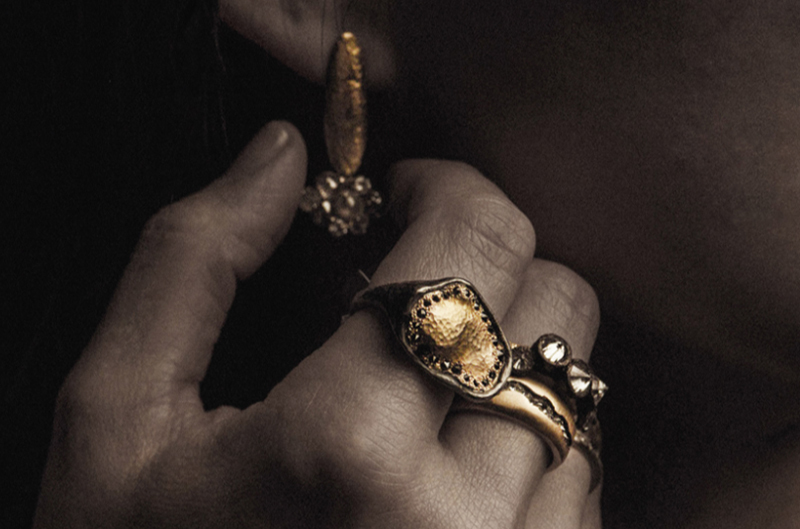 Their complementary perceptions work together to create the romantic vision within Todd Pownell’s jewelry designs, that have been praised as the pique of craftsmanship and creativity. Todd Pownell’s root aesthetic is in combination enchanted, sophisticated, and a celebration of the natural elements. Jewelry has been regarded through history as trophies and tributes, critical in the celebration of beauty in many cultures and events in history. As such, it is his belief that a simple adornment can showcase the clarity of light and how it mixes with the splendor of earth’s naturally created gemstones. Harmony, mystery, and the universe are other themes within each of his pieces. Todd’s signature design is the “upside-down,” or reverse set diamond. By setting the gemstones in an unconventional way, it reveals a new perspective on how diamonds can capture and reflect light at oblique angles. Light and dark are key concepts in his work, as he constantly experiments with the two, both in terms of the color of materials he uses the way light plays off of his creations. Rugged edges contrast with the refined, showcasing how juxtapositions can create an inherent balance within each piece. Their elegant designs are only enhanced by their moral practices as ethical metalsmiths. Todd and Debra hold respect for the innate properties of noble metals and gemstones, as well as their social and environmental responsibilities. From promoting a healthy working environment for their employees, to working with ethically mined gemstones, metals and working with recycled source materials, it is clear that Todd and Debra care deeply about the impact on others and the world around them.